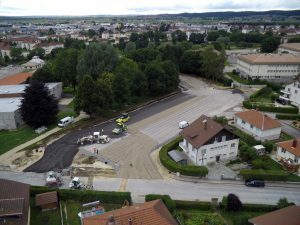 As part of the overall renovation of the Place Becquerel in the City of Pontarlier (25), Vermot TP (a subsidiary of Eurovia) installed Power Road® in August 2017 to clear snow and ice from the parking lot of the Lycée Xavier Marmier (located at Place Becquerel), the bus platform and certain sidewalks in winter. The energy source provided for its operation is the Pontarlier heat network whose energy is generated by the combustion of household waste using the waste energy recovery unit (Valopôle). Laying pavement that allows automatic snow clearing in the car park lot of the Lycée Xavier Marmier (4,400 m², of which 3,500 m² are equipped) provides an opportunity to extend the heat network and rejuvenate the aging car park. This project will allow to define the protocols for connecting to the heat network and for measuring and optimizing the energy balance using this mode of operation… all the while enhancing the comfort and safety of users (reduced accident risk, the safety of students, staff and visitors).